SPECTREOUTREACH.com: The RM203,000 WeBUY Community Giveaway Project! The RM203,000 WeBUY Community Giveaway Project! Not only that, "WeBUY will be drawing 10 lucky winners to WIN a RM300.00 extra to their WeBUY e-wallet if 10,000 is reached." Now that's what I called super awesome deal! To top it up , Webuy is having Xtraordinary deal on Ah Tuan ee's place and The Cube on their side deal. Just perfect for awesome possum foodie adventure for friend and family alike!Wait there's more ,I not kidding! 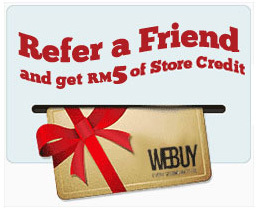 Webuy is giving out Rm 5 for Refer Friends, Earn RM5 campaign where every subscribers who will earn RM5 for every 1st purchase of the friends referred. Just click below for more info and sign up ASAP to gain access to latest deal! C'mon sign up and join the latest hottest deal in town!